Costa Rica is renowned for its excellent environmental record, but with the construction of a 150km road beside the San Juan river it appears to be going against that reputation by causing enormous damage to the environment. Known as one of the originators of eco-tourism, and appearing a very creditable third in a world index of sustainability, Costa Rica has a reputation to maintain. Its tourism industry, based around the country's slogan 'No artificial ingredients', is worth over £2bn annually, more than its coffee and banana exports combined. Though the smallest country in Central America, it receives the most tourists. Many of these are attracted not only by its forests and beaches but by its environmental reputation: you can travel to Costa Rica and feel good about it. As a result, it makes frequent appearances on lists of the top eco-tourist destinations. And yet the present government, headed by President Laura Chinchilla, is putting all this at risk for the most trivial reasons, ones that people who live outside the region will find incomprehensible as they become more widely known. This is not to do with deforestation, or environmentally destructive mining projects (though both these are significant issues, and sometimes permitted on economic grounds), but its apparent wish to achieve the destruction of one of the most beautiful and ecologically important river systems in Central America, purely for political reasons. The San Juan river is unusual in many different respects. It drains what is effectively a significant inland sea, Lake Cocibolca in Nicaragua, one of the largest freshwater lakes in Latin America. Heading south-east towards the Caribbean, in almost 200km it falls only 30m, which is one reason that it is both ecologically rich and environmentally vulnerable. Historically, it was a strategic point of conflict between Britain and Spain, marked most notably by Nelson's defeat when he attempted to penetrate Nicaragua via the river in 1780. It then became the focus of plans for an inter-ocean canal, owing to the proximity of the western shore of the lake to the Pacific Ocean. When investment shifted to Panama and its canal eventually opened in 1914, the river lapsed into obscurity, little visited but harbouring in its waters or on its banks a fantastic range of wildlife from the bull sharks that can migrate from salt to fresh water, to turtles, manatees, caimans, macaws, monkeys and jaguars. For just over 150 years the river has also had the misfortune to be part of an international boundary. This, of course, is far from unusual, but in the case of the San Juan River the oddity is that the frontier runs – not down the centre of the river – but along the southern bank. For the lower half of the river’s length, the right bank belongs to Costa Rica, but while Costa Ricans have rights to use the river for 'trade', the water belongs to their neighbour Nicaragua. Not surprisingly, this has led to disputes, some reaching as far as the International Court of the Hague. The most recent of these, which began a year ago, is being deliberated by the court at the moment. Inevitably, the facts are disputed, and the argument even required a redrawing of the boundary shown on Google maps. The following summary attempts to be impartial. Before it enters the Caribbean, the south-eastward running river makes a capricious turn to the north, taking the international boundary with it. One branch of the river, called the Colorado, heads more directly for the ocean to the east, and as this is in undisputed Costa Rican territory they have dredged it to aid navigation. In 2010 Nicaragua decided to dredge the old main course of the river, arguing that this was necessary to maintain navigation to the estuary town of San Juan de Nicaragua, given that much of the outflow is now via the shorter Colorado. Costa Rica vigorously complained about the environmental damage being caused by the dredging, whereupon Nicaragua sent a detachment of troops to the area, which (according to Costa Rica) set foot on the disputed 'island' between the San Juan and the sea. Matters escalated, with Costa Rica appealing successfully to the Organisation of American States, but with Nicaragua arguing that the OAS lacks the power to solve boundary disputes: as a result the case has gone to the Hague. A final judgement is awaited. But in the interim the court ordered the two neighbours to desist from troop movements in the area, although it allowed the dredging operations to continue as long as they were confined to undisputed stretches of the river. There matters appeared to rest, pending the lengthy deliberations of the international court. Popular sentiment in Nicaragua had been aroused, t-shirts proclaiming that the ‘San Juan River belongs to Nicaragua’ became common, and the issue became a minor factor in the run-up to November's election, in which Daniel Ortega was returned with 62% of the vote. In Costa Rica, in contrast, there seemed to be little interest in the matter or popular clamour to contest Nicaragua’s reassertion that the river is theirs. The likelihood of Ortega's election victory appeared to incite the anger of his Costa Rican counterpart Chinchilla, however. Claiming that she was acting to protect Costa Rica's 'heritage', she ordered the construction of a road along 120km of the river bank (see photo). The road runs as close to the river as is physically possible, cutting right through a 60,000-hectare protected area that only 18 months ago was designated a ‘Wetland of International Importance’ by Costa Rica itself. Chinchilla argues that the road provides guaranteed communication for Costa Ricans, who no longer need to depend on Nicaragua's river, although the right of navigation is in any case guaranteed by an earlier ruling from the Hague in 2009, which Nicaragua accepted, and the road appears to cut off many of the farms in the area from the direct access their land had to the water. What cannot be disputed is that the building of the road is resulting in almost indescribable damage to a highly sensitive environment. The San Juan River, particularly the stretch from El Castillo to the Caribbean, which forms the international boundary, is a near paradise. Its left bank hosts the almost unspoilt Indio Maiz nature reserve, one of the largest remaining areas of tropical forest north of the Amazon. The right bank is a mixture of woodland, farms and wetlands. Not surprisingly, both countries have designated major parts of this wildlife corridor as protected areas under the international Ramsar convention. Importantly, neither bank has any significant settlement, and in fact Nicaragua has in the past expelled settlers from the nature reserve (which does have legitimate settlements by an indigenous group, the Rama indians). All this has, within the space of a few weeks, been put at massive risk by the road. The potential environmental damage is enormous. First, the proximity of the road to the water means that pollutants will drain directly into the river. The road building has ripped out much of the remaining forest and makes it difficult for wildlife to go back and forth between the river and upland habitats. It has opened up a sparsely inhabited area to settlement. The massive earthworks taking place will speed up erosion in a region subject to heavy rains. Then there are the effects on the unspoilt forest on the opposite bank. This already suffers from illegal hunters crossing from Costa Rica and allegedly bribing forest guards. The road will make this easier and provide many more potential points of penetration into the forest. 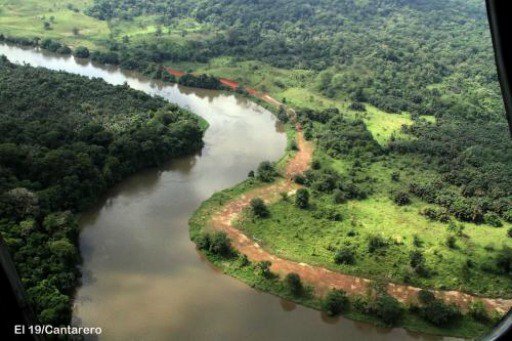 The ecological value of the river corridor, bounded by the forest, has been significantly reduced by the loss of tree cover and the protection it offered for birdlife using both banks. Illegal timber extraction will be much easier than before. The worst risks of all come from the drugs trade which at present largely avoids this zone as there are no obvious south-north corridors along which drugs can pass. But the endlessly inventive drugs cartels, for whom Costa Rica and Nicaragua are the Central American countries where their supply chain is weakest, are probably already looking at their Google maps and noting the limited presence of border guards and the military, and the potential of a 120km, barely used road. All this has apparently been ignored by the Chinchilla government in perpetrating what looks like a simple act of political spite. Well aware of the significance of the San Juan River to Nicaraguans, and assuming their own nationals will welcome an apparent strengthening of their northern borders, they have carried out a $14 million act of gross vandalism, violating an environmental protection agreement on which the ink is barely dry. Fortunately, it is not too late to repair the worst of the damage. Still unsurfaced, the road would in time revert to nature if it was left unused, and trees could be replanted. Will sanity prevail? The International Court of the Hague has been asked to consider the road as part of its judgement in the pending case. But where are Costa Rica’s eco-champions, who have successfully challenged so many other potentially disastrous projects?